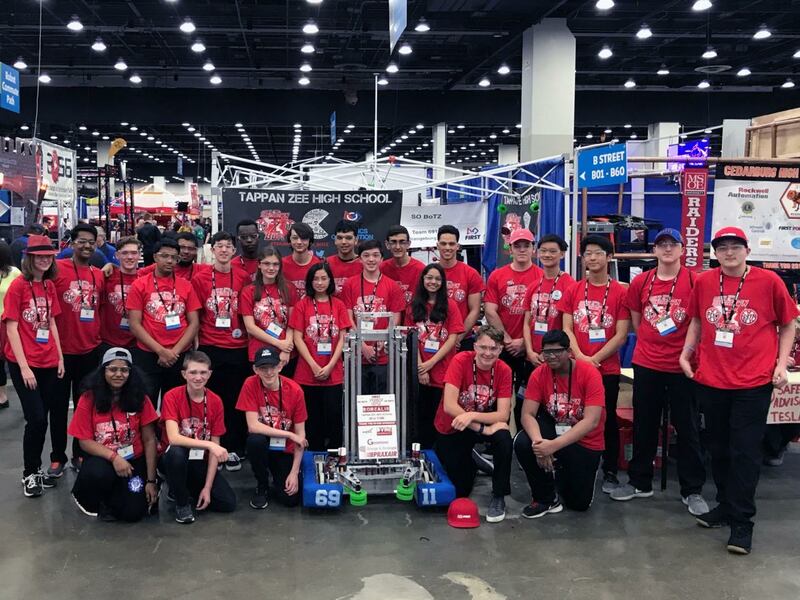 Tappan Zee High School’s rookie first Robotics Competition Team 6911, South Orangetown BOTZ, won the Rookie All-Star Award at the FIRST Championship Detroit on Saturday, April 28. The team advanced to the international competition after earning the Rookie Inspiration Award at the Hudson Valley Regional FRC Tournament at Rockland Community College in March and the Rookie All-Star Award at the SBPLI Long Island #1 Tournament at Hofstra University earlier this month. Of the 7,000 FIRST Robotics Competition teams globally, 405 advanced to FIRST Championship Detroit (April 25-28, 2018). The Rookie All-Star Award celebrates the rookie team exemplifying a young but strong partnership effort, as well as implementing the mission of FIRST to inspire students to learn more about science and technology. The team has garnered strong support from NASA, Orange & Rockland Utilities, Praxair, D’Vine Hospitality, Goosetown Communications and other locally-based businesses, and has actively promoted robotics, engineering and computer science through activities ranging from outreach at the SOCSD School Maker Faire and mentoring younger students to expand the local tech talent pipeline.